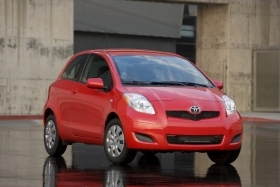 Strong sales of the Yaris helped Toyota reduce its fleet CO2 output by 14.8g/km. TURIN – Toyota showed an impressive reduction in its fleet's average carbon dioxide emissions in 2009 and now trails No. 1 Fiat by a small margin in the race to be Europe's greenest brand. Automakers competing in Europe are under pressure to reduce the emissions their cars produce ahead of stricter CO2 rules that start to take effect in 2012. Toyota slashed its average CO2 emissions to 130.1 grams per kilometer last year from 144.9g/km in 2008. The reduction moved Toyota ahead of Citroen, Renault and Peugeot, according to data compiled by UK-based market researcher JATO Dynamics. The Fiat remained No. 1 for the third year in a row by reducing its average CO2 emissions by 5.9g/km to 127.8g/km in 2009. Toyota's average was helped by sales of the Toyota Prius gasoline-electric hybrid – Europe's greenest model with CO2 emissions of 95.6g/km, according to JATO's data. However, the Prius sells in small numbers so it does not provide as much of a benefit as a strong-selling model with slightly higher CO2 numbers such as the Yaris subcompact. Toyota's top-selling car was No. 1 in Europe with volume-weighted average CO2 emissions of 119.0g/km, according to JATO. Trailing the Yaris was the second-ranked Fiat Panda minicar, which had an average CO2 of 119.9g/km in 2009. The industry as a whole reduced its volume-weighted average CO2 emissions by 7.9g/km last year. That means that more than half of all cars sold in Europe now emit less than 140g/km, according to JATO. All automakers must decrease average CO2 emissions to 130g/km by 2015. Scrapping incentives in the major European markets – Germany, France the UK, Italy and Spain – encouraged people to replace their old cars with newer, more fuel-efficient models. The billions in financial subsidies given in the midst of a deep recession led to a huge sales increase for low-cost, low-CO2 models such as the Panda minicar and Yaris subcompact. Also driving sales of these cars was customer demand for "green" products. “The marked reduction in average CO2 emissions is a consequence of changing buying habits and in particular, the downsizing to smaller, more economical cars, driven by scrappage incentives and recessionary uncertainties,” JATO head David Di Girolamo said in a statement.